But it wasn’t water. It was blood. Sherrece's obstetrician, Dr. Tage Born of Avera Medical Group OB/GYN Aberdeen, had diagnosed her with placenta previa early in the pregnancy - a condition that is not uncommon. As in most cases, Sherrece's condition resolved itself, and her pregnancy progressed without complications. Sherrece was told not to be too concerned. She needed to be careful and not lift too much and could expect everything to turn out fine. But now she found herself sitting in the bathroom, terrified and fearing the worst. She called a nurse practitioner friend of hers, who rushed her to the local emergency room in Ashley, N.D.
Plans were quickly made to transport Sherrece to Avera St. Luke’s Hospital in Aberdeen, S.D. To speed the process, a Careflight helicopter was dispatched to meet the ground ambulance on the way. Placenta Previa can resolve, but if the location of the placenta is fairly low, there is increased risk of premature separation or abruption. That’s when speed counts. Careflight was on the way while the Ashley ambulance started heading toward Aberdeen. They met 12 miles outside of Ashley and made the transfer. Dr. Born knew that timing was critical. This type of situation is not common. About 1 percent of pregnancies are complicated by placental abruption, and 12 percent experience death of the child before birth. She may not have known the percentages were working against her, but Sherrece did feel better when Careflight landed and she was wheeled into the Avera St. Luke’s emergency room. She was taken to surgery where the baby was delivered by Cesarean section. “When I woke up, and a nurse was standing in the recovery room holding my daughter’s picture and said, ‘You had a little girl’, I had tears of joy,” said Sherrece. It had been a whirlwind experience – discovering the bleeding at 6:30 a.m. and having her baby by 8:12 – 80 miles from home. Neither baby nor mother had any complications. Since that experience, Sherrece and her husband Willis were blessed with another pregnancy. At first, the fear of a repeat experience was a concern. Even though she had the C-section delivery for her second child, Sherrece was able to deliver her next baby girl by normal vaginal delivery, a choice she made for herself after considering all of the information from her doctor. Sherrece Zimmerman, pictured with her daughter Trinity. 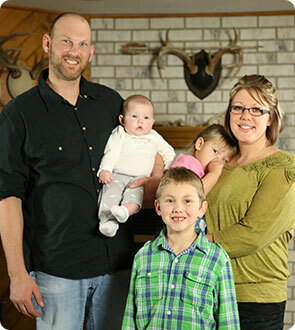 Sherrece and Willis Zimmerman, of Ashley, N.D., are pictured with their children, (left to right) Aleah, Parker and Trinity.